Whenever I make my Roasted Whole Chicken and Vegetables (one my very favorite recipes) or Slow Cooker Whole Chicken, I sometimes have chicken leftover. So, I throw it in the freezer. When I’ve got a few cups of cooked chicken in the freezer, I’m ready to make this delicious chicken freezer meal: Chicken Parmesan Casserole. My family loves this simple chicken freezer meal recipe because it’s an old family favorite in a comfort-food form. I bet you have most of these ingredients on hand: tomato sauce, shredded mozzarella cheese, panko or whole wheat bread crumbs, and maybe a few fresh herbs. That’s it. You can eat it by itself or serve it over pasta. It might be nice over a bed of rice, too. Look at these simple steps. Anyone can do this! Note: The recipe is for an 8×8 pan and the pictures below are in a 9×13. I did have to double the recipe to do this. 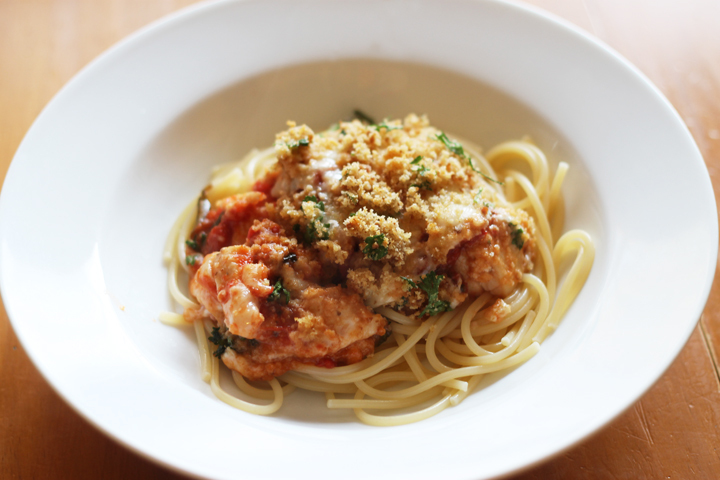 If you’re looking for a variation, this is another great Chicken Parmesan recipe. 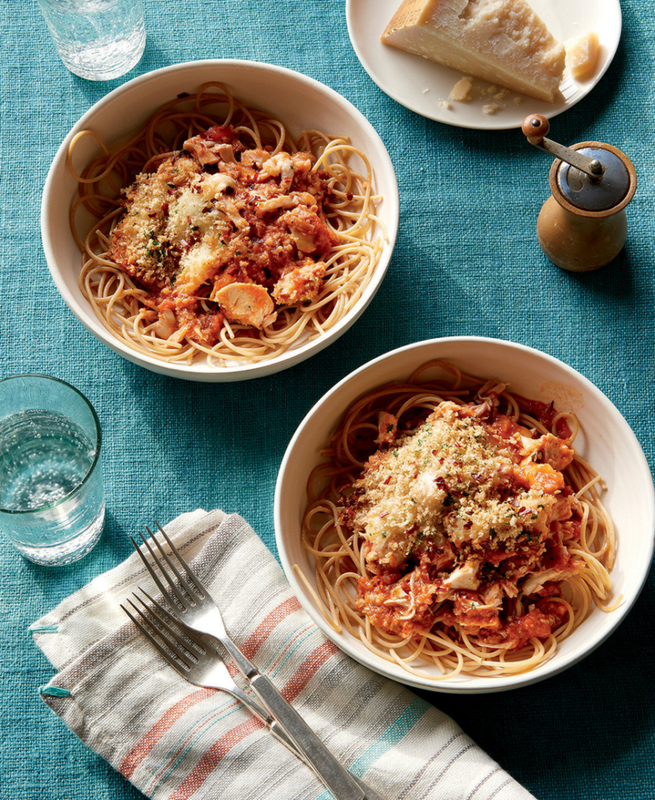 This delicious weeknight meal made for a whine-less dinner. Sure hope you enjoy it as much as Polly’s little guy did. The easy-to-print Chicken Parmesan Casserole recipe is below, but I wanted to mention that, as with so many of our freezer-friendly recipes, this Chicken Parmesan Casserole freezes wonderfully. Freezer meal directions are included at the bottom of the recipe. So be sure to make two and freeze one of them! 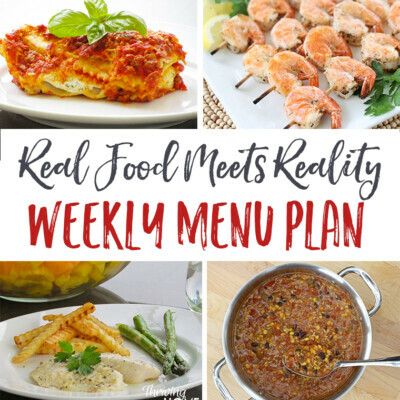 This family favorite is super easy to make, made with real food ingredients, and also freezer friendly. Layer the chicken in the bottom. Dump in the marinara sauce and mix with the chicken. Next, top with both cheeses until all the chicken is covered. In a small bowl, mix the breadcrumbs, olive oil, fresh herbs and a dash of salt and pepper together. Sprinkle the seasoned breadcrumbs over the top. 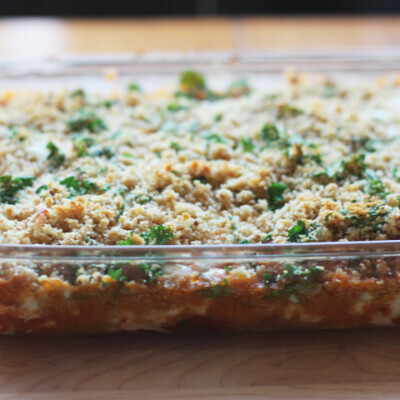 To Freeze: Put casserole together and freeze it before baking. To Prepare: Let it thaw in the fridge over night. If it’s still slightly frozen in the middle, you’ll just have to cook it longer than the recipe calls for or defrost it a bit in the microwave before baking. Cover it with foil if the top gets too brown in the oven. I really love bacon. Can I add it, it will not spoil the chicken Parmesan? I added par cook spaghetti noodles mixed with a half a jar of sauce on the bottom layer, another jar and a half of sauce on top of the chicken with some extra seasonings to taste. I topped the casserole with Panko breadcrumbs mixed with a little butter, Italian seasoning, and grated Parmesan. I added the breadcrumb mixture of the last 5 to 10 minutes of cooking. Everyone love this meal! I absolutely love this recipe! What I cannot remember is do you have to cover this with aluminum foil when it bakes? We are cooking from fresh, not frozen. It is been so long since I have made it I cannot remember. I substitute crushed pork rinds for the breadcrumbs to bring the carb count down even further since we are on a low-carb diet at our home. Hi! 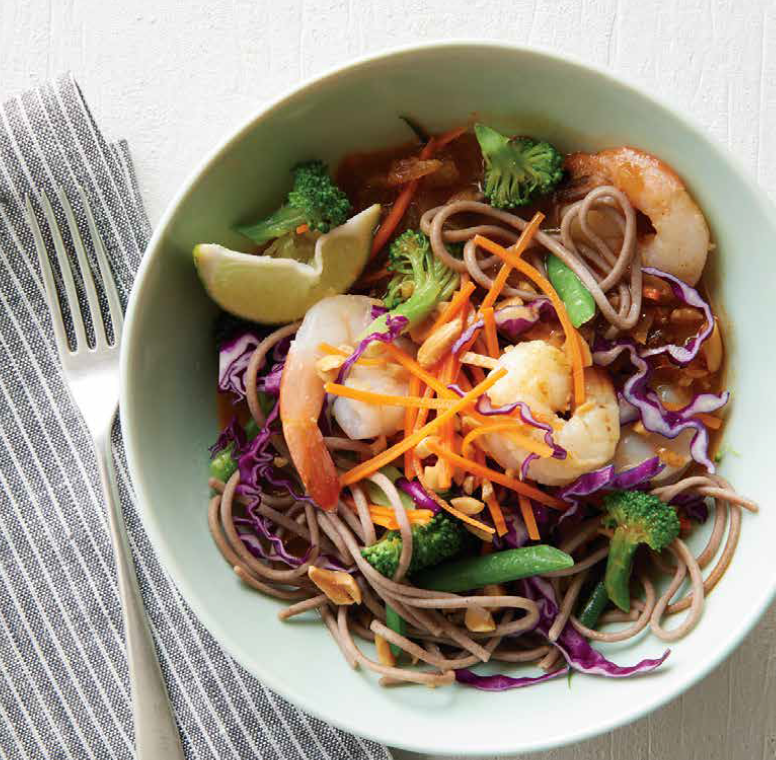 I’d love to add noodles to this dish- would you recommend adding par-boiled, fully cooked or uncooked pasta to the layers, and at what point in the layering process would you do so? Thank you! Hi Hannah, I would suggest adding cooked pasta (only cook to al dente) at the bottom and combining it with the sauce and chicken to make sure it is coated. Then, top with the cheese and breadcrumbs. Hope that helps! Should the chicken be defrosted if using frozen fully cooked chicken? I haven’t tested baking this casserole completely from frozen. 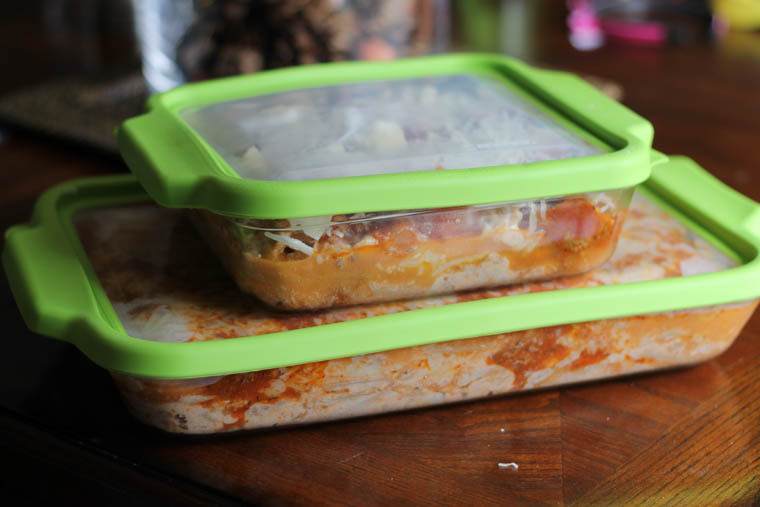 We find that our best results with almost any freezer meal is when it’s thawed first. Love to make this on Sundays for the week. I like to Usenet unseasoned bread crumbs and season the dish myself. Such a great idea to make it ahead for the week, Andrea. Can I use Alfredo sauce instead? I haven’t tested that before, Tiffany, but I’m sure it wouldn’t be bad! Classic chicken parmesan is better than this casserole, imo. It’s definitely a recipe that requires noodles. Untimely everyone was satisfied with dinner, I think I may sneak some veggies in next time I make it. Hi Cecily. I haven’t tested this in the slow cooker, so I can’t say for sure how this will turn out. But, you would cook the chicken and marinara sauce for 2 1/2 – 3 1/2 hours on LOW and then shred the chicken. Top it with the cheese and breadcrumbs and slow cook until warmed through and cheese is melted…probably at least 30 minutes. The downside is that the topping won’t get crispy in the slow cooker like it will in the oven. Can you bake this from frozen without thawing it? Double the time? Yes, but cover with foil until the last 15 minutes or so. I would at least double the cooking time, but it may take longer. Bake until the edges are bubbly and the center is warmed through. I would say about 4-6 servings. I would suggest using pre-cooked chicken, then assembling the casserole with it, and then freezing. A short cut is to buy a rotisserie chicken from the store and use that as your chicken. Hope that helps! How long will this freeze for? If you wrap it tightly and freeze in the back of the freezer, it should be fine for at least 3 months. I pinned this recipe about a year ago and my family **loves** it! 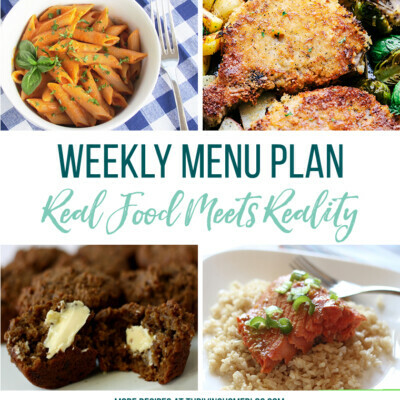 This meal regularly appears on my Monthly Meal planning page from Sisterswithasystem.com because it is easy, economical, nutritious and freezer-friendly. Thanks so much for sharing! Second time making this dish, super easy to make, and practical, love it thank you! Great to hear, Elsie. Thanks for the feedback! I prefer freezing single portions so I made them in pie plates. Would I heat these the same as a casserole? What temp. and time would you recommend? I would say same temp, but it may take less time. Just look for them to be bubbly around the edges and you’ll know it’s ready to go. I made this today, but was looking for recipes with rotisserie chicken. Instead of baking I combined the chicken and marinara sauce in a pan, added herbs de provence, seasoned black pepper, a little salt, sauteed mushrooms and a little cooked spinach. Once all the ingredients (plus the cheese) were mixed together I let it simmer, then put the Panko on top. I am typically low-carb so don’t usually eat a lot of pasta. Just put in a bowl and ate it – yummmm!! Yummy! Great idea. This is definitely a great dish to use rotisserie chicken in. I do the same. I am trying this for my family tonight. You mention that Costco rotisserie chicken is gluten free, which is not a concern for my family, but we will be having a guest this weekend and I need to make a gluten free dish. I contacted Costco to confirm that the Hand Pulled Rotisserie Chicken Breast is gluten free and the customer service rep would not definitively say that there is no cross contamination during processing. Did you confirm with Costco that it is gluten free? Thank you. Hi Bethany. I’m sorry but I don’t remember saying that anywhere and am not familiar with Costco at all. Are you talking to another Rachel on this comment thread? THANK YOU! My husband loves this recipe and so many more that I have found here. I do a weekend of batch cooking/ freezing and we are set for a few weeks. Our food bill is down significantly because we don’t have any reason to eat out! This is one of the best comments ever. 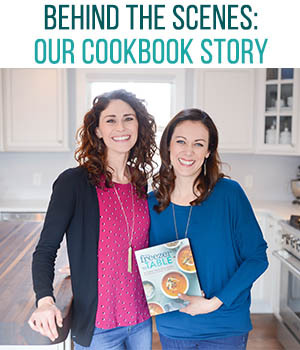 We love hearing that our site and recipes are helping others like this. Great job, Rebecca! Could I freeze the casserole after baking for a later meal? I freeze leftovers all the time and rewarm them, but it won’t taste as good as if you had prepped it ahead, frozen it fresh, thawed, and then baked. But, I honestly don’t mind leftovers that have been rewarmed, so it’s up to you! Question- if I double the recipe and use a 13 X 9 pan- does the cook time remain the same or does that increase as well? Thanks! It’s close to the same. Just look for the sides to be bubbly and the top to be golden brown. Since everything is already fully cooked, you’re just wanting to warm it through. You’re welcome, Sue. We love hearing this! This casserole is easy to make and very tasty. 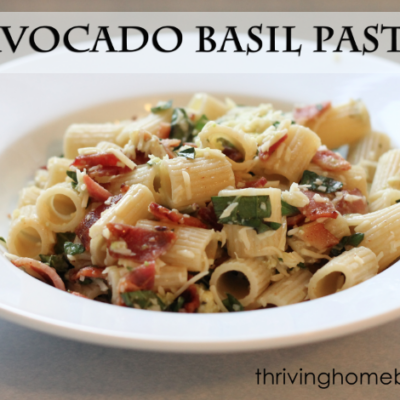 It’s great with dried herbs but even better with fresh basil. I like to serve it with a simple green salad with balsamic dressing. Yes, fresh herbs can make a huge flavor pop in this casserole topping. Thanks for the review, Colleen. This one is a keeper. Minutes to prepare and everybody loves it. Oh what a fabulous idea to jazz this up and serve as an appetizer! Can you tell me how many adult servings you would get from the recipe as printed above. I’m feeding a group of 50 and I was thinking of adapting this. I’m sorry but we don’t provide that information on our recipes. What size dish should actually be used? In the pictures it’s a 9×13, but the recipe says 8×8. Thanks! 8×8 is correct. Sorry for the confusion. The pictures show this recipe doubled. How many servings is this recipe? I’m trying to feed a group of 22! I would say one 8×8 casserole dish feeds 4-6 people pretty generously. If serving over pasta, easily 6. Hope that helps! How many servings is the 8×8 and 9×13? This was an amazing dinner for my low carb family. 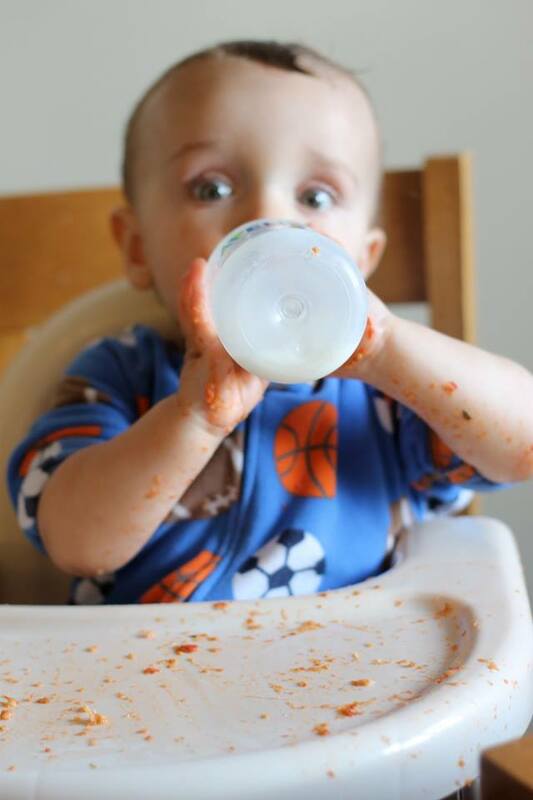 We didn’t even MISS the pasta! Thank you for your recipe! I make this quite a bit now! 😀 It’s yummy! I do use frozen, grilled and ready chicken, pre cut. I also use the suggestion of the croutons instead of breadcrumbs. Does the chicken have to be cooked? If you double the recipe and cook in a 9×13 glass casserole dish, would the amount of time to bake in the oven need to be updated? No, probably not. But just look for the corners to be bubbly and that it is hot all the way through. My family and some friends that I’ve shared this recipe with LOVE this casserole!!! 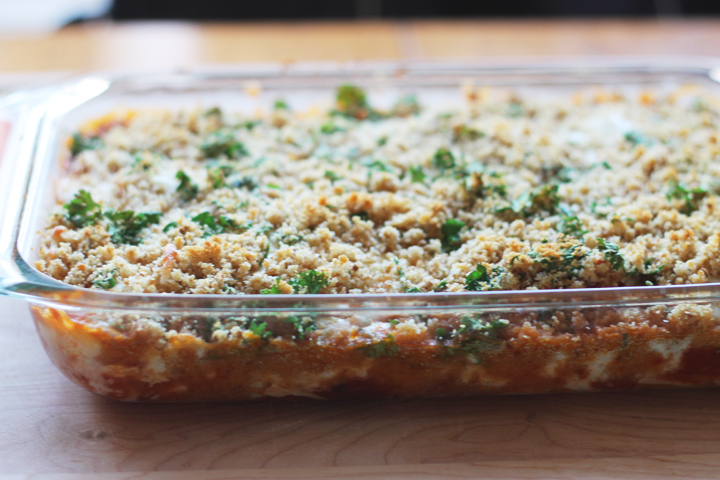 This casserole is going into our regular dinner rotation! Thank you so much! Just curious, since the Chicken is already fully cooked before putting it in the oven does the chicken get dried out after going in the oven? Thanks! Nope, it does quite well! Thank you so much for this recipe! I think I will opt for the uncooked chicken (cubed) as well as I do not normally care for the taste of reheated chicken. Thanks again! Well, we recommended using pre-cooked chicken but you can use raw chicken if you cook it long enough until it’s done inside. If you use raw chicken though, it needs to be in bite-sized chunks so it cooks quickly and all the way through. And, I’m not sure how you can cut up frozen chicken easily. So, I would say that probably won’t work. Sorry! I have made this several times but i usually don’t freeze it. Always a hit. Thanks. You’re welcome, Trish. Love that it’s a hit! Could you add Fresh Spinach? What is the purpose of the Olive oil? Would it work without it? The oil helps the breadcrumbs toast up and yet stay moist. It will be pretty dry on top without it. 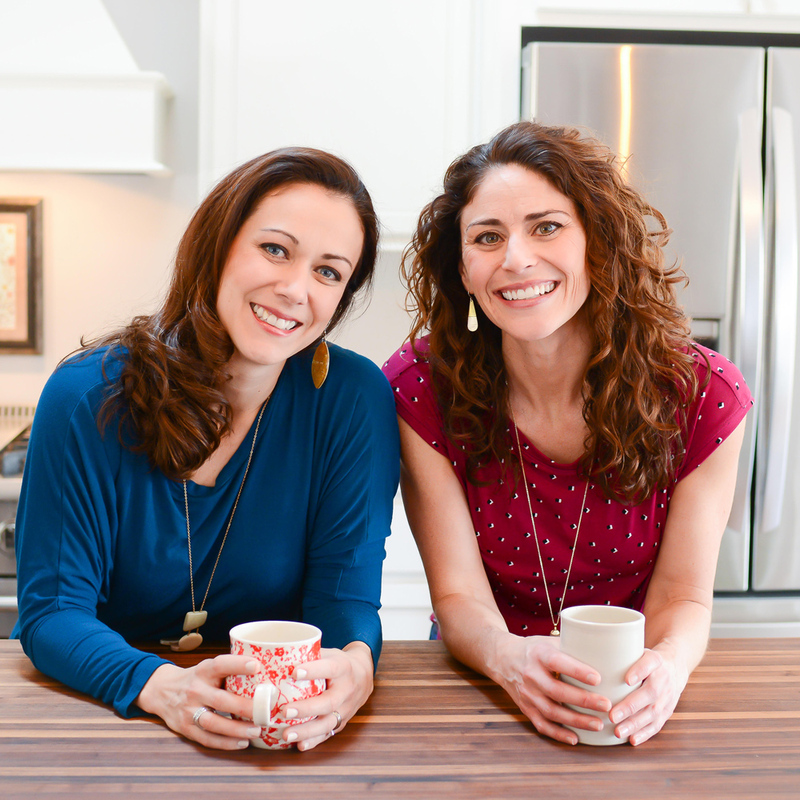 Love your freezer meals! Makes eating at home super easy! Could I just prepare and leave in the fridge for a couple of days? Going out of town for work and want my something ready for everyone to eat with no prep. Yes, it should be fine for about 2-3 days. Leave the breadcrumbs off so they don’t get soggy, though. Good luck! Looks so good but I am confused by the pan size. In the directions it says 8×8 but that last photo of the dish complete it clearly looks like 9×13 pan Can you please clarify? Thanks!! Sorry for the confusion! It says this in the post, but the pictures show this casserole doubled and baked in a 9×13. The recipe is for an 8×8. Sorry again. Yes- I could see how that would be confusing. We need to update the picture! Use a 8×8 dish. Just wanted to say, this came out great! I DID add cooked spaghetti to the dish and it worked great! I used a 12 oz box of spaghetti. I broke the spaghetti in half, cooked it for two minutes less than the time recommended on the box, and then mixed it with the chicken and pasta sauce – also, I used a 32 oz jar of pasta sauce (instead of a 28 oz jar) to give the spaghetti some more liquid. It made enough to fill two 8×8 pans with the spaghetti mixed in. Once reheated the spaghetti was perfect doneness. That’s such a great tip, Tiffany. We have readers ask often if you can add pasta. I’m glad you’ve tested it for us! Hello, what is your opinion on the aluminum foil pans for baking things like this as far as safety goes. I do have a glass pan (I’m trying to get rid of a lot of plastic in my life, especially things for eating and drinking) , but I am thinking of getting some foil pans for freezer meals. I personally try to avoid foil if I can, just because some research has shown a link between aluminum and Alzheimer’s. Not sure how strong the connection is, but glass is always a safe option. How many pounds of chicken breast would you say is nexessary for this recipe? About 1.5 pounds. I added that to the recipe in case someone else had the same question. Thanks! Since I’m low-carbing it, I will swap crushed pork rinds for the breadcrumbs, or leave them out entirely! The pork rinds will add a hint of bacon flavor. Wondering if you think this would work with eggplant? I have yet to try eggplant in this way yet, but from the recipes I’ve read, I bet it would if you let it drain over a colander first. Good idea! Please let us know if you try it and it works. This is delicious! My husband doesn’t really like white meat chicken, but if I put it with sauce or gravy, he’ll eat it. I cut chicken breasts into small pieces and made this in a 13″x 9″ dish so that the chicken would be more covered with sauce. My family really liked it and my husband said over and over how good it was. I’m so surprised that he acted that way about a chicken dish! Thanks for sharing! Sweet! We love a good success story. After reading all the fantastic comments about this recipe, I had high hopes. I made it exactly as recipe stated. My husband said there is way too much chicken in it and I couldn’t eat much of it. I’m not sure where all the awesome comments came from, but we didn’t like this at all. How many people would you say the 8×8 serves? 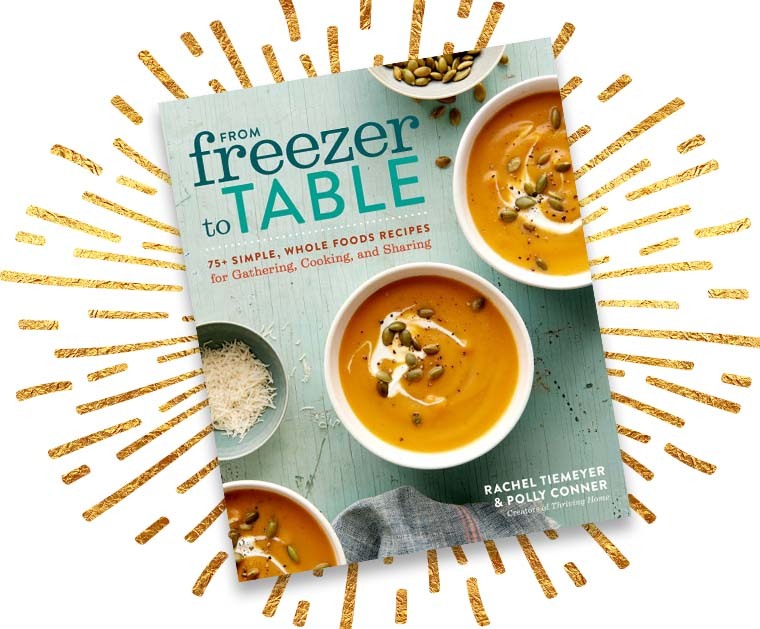 I’m always looking for new recipes to freeze. We had this last night and it was delicious! The breadcrumbs took it over the top! It was super easy to make and I could easily hide some veggies in there. Thank you for the recipe! I love hidden veggies…the best! If I put this together tonight could I just keep it in the fridge until tomorrow? Or should I freeze it over night and put it in the fridge early in the morning? It can stay in the fridge tonight for sure. No problem. You could leave the breadcrumbs off and put them on at the last minute to make sure they stay crisp, but you wouldn’t have to. 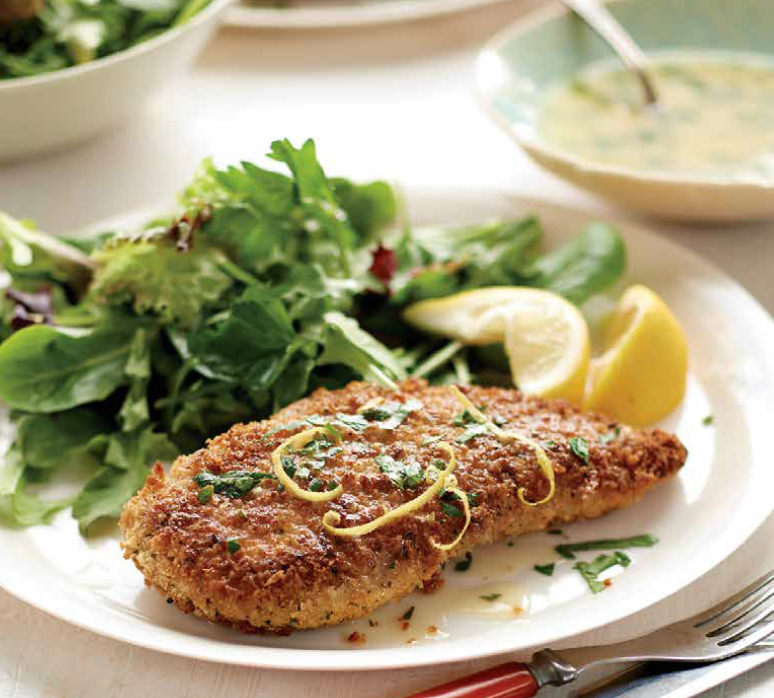 Made this tonight using gluten free bread crumbs and we all loved it. It was simple enough to just throw it all together with our pre-cooked chicken and bake. Alright! Glad you enjoyed it! So glad you liked it and thanks for commenting! We love to hear from readers! I made a couple pans of this for the freezer so haven’t eaten it yet. However, I used the canned parmesan instead of fresh and am wondering if you think that it will still taste okay? I am hoping I didn’t ruin it. Oh it will be totally fine! It’s hard to mess this one up. I made this and put in freezer and used the canned parmesan cheese…wondering if you think the canned will be okay? It didn’t specify and that was all I had on hand. Hoping I didn’t ruin it since I made two pans for the freezer. I just want to say this was pretty darn good. I bought new chicken breast and cooked them for about 45 minutes on 350 and chopped them up after they cooled off. I honestly didn’t feel like buying and cutting up fresh herbs so I coated the chicken prior to cooking with salt and a healthy amount of Italian seasoning. I used a reduced-fat mozzarella cheese. After about 30 minutes in the oven, I switched the broiler on to brown the breadcrumbs (I used Italian breadcrumbs). I served whole wheat thin spaghetti on the side. My five year old son ate this up!! Last night it took him almost two hours to eat what I made off of Pinterest. I will make this again for sure!! What kind/how much herbs do you use? I would use dry. Thanks! Maybe a total of 1 teaspoon dried herbs, crushed in her hand. Hello, I am going to make this on Tuesday and wondered if you used grated or shredded parmesan? Also, a tip for anyone doing low carb – you can crush up pork rinds to make a breadcrumb-like topping. I’ve done this on another dish and it’s delicious! Either kind works fine. I’m partial to the freshly grated just because it doesn’t have additives. Delightful and very versatile dish, you can pair it with almost anything!! I added some Dry sliced pepperoni from Fantino&Mondello to mine, gave a great twist to this recipe. Thanks again, I will without a doubt try more of your recipes! This looks delicious! I’m going to try it tonight! My only question is, I don’t have marinara sauce, but I do have a pasta sauce that I can use. Do you think this will taste alright if I substituted the marinara with the pasta sauce? I’m not quite sure what the difference is or if there is one…so yes, I think you’ll be just fine! I love that! Thanks for dropping us a line, Barbara! An 8×8 pan of this (what the recipe makes) serves 4-6. This was super delicious! Everyone in the family loved it. It was also very easy to throw together. My family considers this a favorite recipe. I make large quantities of marinara sauce and store it in the freezer which comes in handy when making Chicken Parm. I’m not a “casserole” person so I wasn’t sold on the idea of Chicken Parm Casserole, but this casserole recipe somehow works. Thanks for sharing. It’s delicious! It’s so great to hear that, Tammy! Thanks! About how many calories per serving does this have? I did it with raw chicken, cut in ~1″ cubes, and 40min at 350 cooked it all through. I didn’t find I needed to cover it, it browned a fine amount. It does end up a bit wetter than with cooked chicken; a little saucy to eat on its own, to my taste, but perfect over pasta. I did also use regular dry bread crumbs this time, as opposed to panko when I made it with cooked chicken, and that could be part of it too. What are the nutritional values or WW points ? Made this tonight and it was a huge hit! Gave my husband a little taste before I started serving it and he wanted to eat it right out of the pan! Thank you, my family really enjoyed it. Can you freeze this with the breadcrumbs on it? I heard that will make them soggy. I do and have no problem, but that’s me. Anyone else is welcome to chime in! P.S. just broil it if it’s soggy at the end to crisp them up. I boiled 4 chicken breast with the bone in, when they were done I chopped up the chicken. I even took out a cup full and saved it for chicken salad and it was very DRY. We ate it but it wasn’t that good. I will have to buy another jar of Marinara to finish off the casserole. I even got the 24 oz jar of Paul Newmans Marinara Sauce. The picture looked like it would be very good. Oh my, this was good! I didn’t expect it to be this good (it was just jarred sauce after all…) But whoa, the flavors melded together and made this a new favorite. Thanks! Glad you liked it! It’s always a hit in our house. 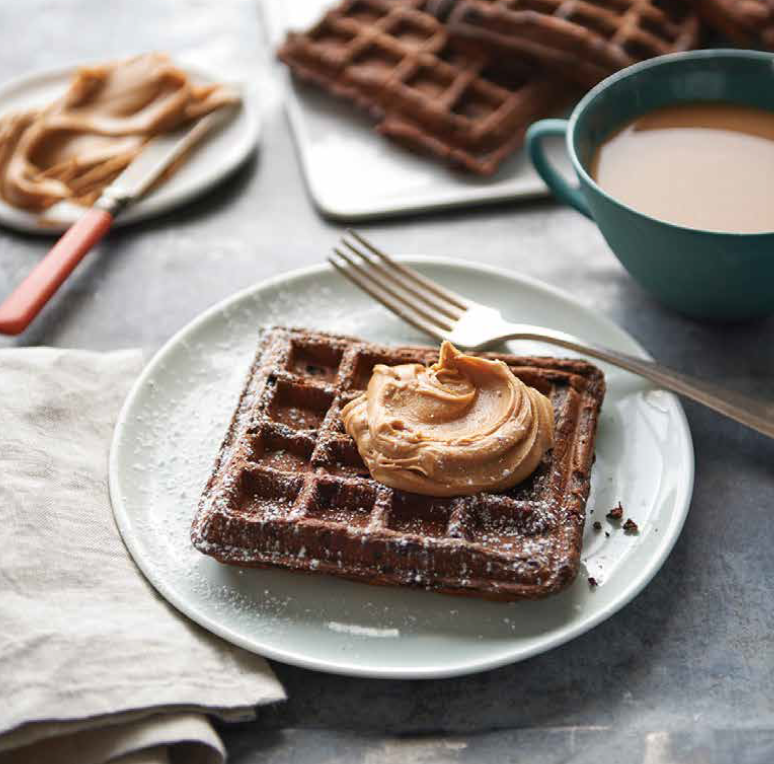 About how many servings would you say the 8×8 pan feeds? I have a family of 6 so I am trying to see if I need to double or even triple this recipe. The 8×8 feeds my family of 5, but my younger ones don’t eat a ton. My guess is that the 9×13 would easily feed yours unless you have some hungry teenage boys. I am wanting to make this recipe and was wandering if you boil your chicken and shred it or do you cube it and cook it in a skillet? You really can do either. Just pick your preference on how you like to cook chicken. I like to bake chicken breasts in the oven at 400 degrees for 20 minutes, let them cool a bit and then chop them up. It really just depends on the consistency you prefer. Sure, I do that all the time. Works fine to warm on the defrost setting in the microwave later or to defrost in the fridge and warm up when ready. This may be a silly question… the recipe calls for shredded chicken but the photo shows cubed. Has anyone had it both ways? Which is better? A valid question. Either way really is fine. Just depends on the consistency that you prefer. Just as long as it’s cooked! I just made this tonight and it was soo good. I added a bag of fresh spinach that I wilted as another layer and I didn’t have any marinara sauce so I just made some spaghetti sauce with chuck of tomatoes and it was a big hit at my house. Thanks for the recipe! Try topping it with croutons instead of bread crumbs. I discovered this little gem when I made this without checking to see if I had breadcrumbs. Now, I only make it with croutons. Just made this for dinner and my husband was a little skeptical, but it was so good!! He thought so, too. The only thing I did differently was use less cheese (*gasp!) because my husband is weird and doesn’t like things too cheesy. REgular bread crumbs will work perfectly! Do you have the nutritional information for this casserole? Sorry, at this time we don’t provide the nutritional information. I think there are tools out there that you can plug the ingredients into to get this information but to be honest, I haven’t done much of this. Can you put this all together the night before and let it sit in the fridge overnight? Definitely! But I might wait to top it with breadcrumbs until right before so they don’t get soggy. Is there some way I could add pasta to this? I think you could add pasta that is cooked al dente to the bottom. Combine with the sauce and chicken. Top with the cheese and breadcrumbs. Good idea! What about veggies? Like broccoli. I am thinking you could add a layer of chopped or baby spinach if you want to add veggies. In fact, I think I will try it. ? Hey! So I just made this for dinner and my boyfriend and I LOVED it! It tastes just like chicken parmesan, but way cheesier. I have a question though. The only thing I didn’t like about it was the bread crumbs got kind of soggy, making the texture kind of weird. Is there anything I can do to prevent this? It might have something to do with the cook time since I used raw chicken so I cooked it for 40 minutes. But if you have any ideas, please let me know! Thanks! Glad you liked it! The raw chicken has more moisture so perhaps that was the problem. The other variable might be what kind of marinara you used. If it was a thinner, watery one, that could have contributed to sogginess. I use Newman’s Own Marinara and it’s a nice density. Another thing you can do at the end is broil the casserole for about 2 minutes to brown up and crisp up the breadcrumbs on the top. Just watch closely so you don’t burn it. I hope that helps! I made this today. I doubled the recipe, but still baked for 25 minutes. Was I suppose to bake longer because it was doubled? The reason I ask is because the bread crumbs were really dry. I am making the spaghetti now to serve the dish for dinner. What can I do so that the bread crumbs don’t make the dish so dry? Oh I also didn’t answer your question about baking longer. If you doubled the recipe and baked this in a 9×13, then it should take about the same amount of time in the oven. Just look for the sides to be bubbly and the top to be golden brown. Would it be okay, to use shake and bake? I’ve never used it myself, so I’m sorry that I can’t help. If it’s just breadcrumbs (more or less), I bet it would work though. I skimmed the posts on this recipe and didn’t see an answer to the following question, so I’m sorry if this was already asked and I just didn’t see it. I made this in a 9X13 pan (I don’t own an 8X8 pan) and doubled everything and now have a HUGE amount of leftovers that cannot be eaten before it goes bad. Could I freeze the rest for a later date? Hi Heidi. You for sure can freeze this for later! I do this all the time. Just thaw overnight in the fridge or defrost in the microwave when you’re ready to eat it. Then, a slow reheat in the oven or microwave will do the trick to warm it! I know this is late, but I just found this recipe on pinterest and was reading the comments. Once something has been frozen, then defrosted…you should not refreeze. Its not safe. Definitely. We are big fans of leftovers. This casserole is very forgiving. I am so confused! When you are ready to re-heat the meal, do you do it for the 20-25 minutes again after it’s thawed from the freezer? It won’t dry everything out? You don’t bake it before freezing. You will thaw and then bake according to directions. your recipe says 8×8 pan, but the photo looks like 9×13…I’d like to make this tonight and want to use the right pan. Great question, and I just made a note in the post about this. The recipe calls for an 8×8 pan, which is correct. 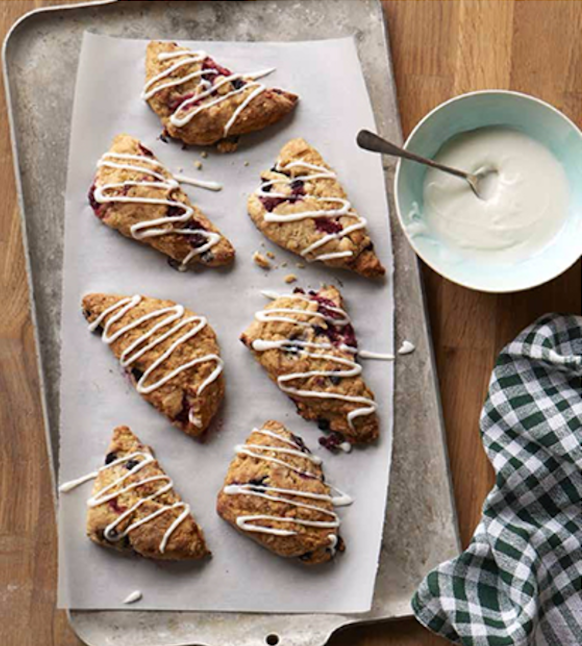 The pictures were taken by Polly later and she did double the recipe and make it in a 9×13. I hope that helps! Oooh, that’s the answer. I need to mix the Parm in with the breadcrumbs. Thanks for the idea! So glad you guys liked it. Looks good. Looks easy. But…Chicken Parmesan Casserole without Parmesan? I’ll be adding it. Stellar point! I’m throwing some in next time too and adapting the recipe. Thanks for the suggestion, Susan! Thank you very much for sharing this recipe! It looks delicious! I want to try it tonight, but has anbody tried using one of those rotisserie chickens in this recipe? Would it become too dry? Christine, I think rotisserie chicken is a great idea. This casserole only bakes a short while and the chicken is covered in sauce and cheese. Should be fine. Can I cook it with uncooked chicken for the casserole? I’ve actually used uncooked chicken in a similar casserole to this one many, many times. You just have to cook it for longer, usually 40-45 minutes, until the chicken is white all the way through. You may have to cover the top with foil if it starts getting too brown. I hope that helps! Sorry, I’m super new to this whole freezer meal thing, but I’m going back to work soon after mat leave, and well, I need quick and healthy meals that all of us (including our daughter) can eat. 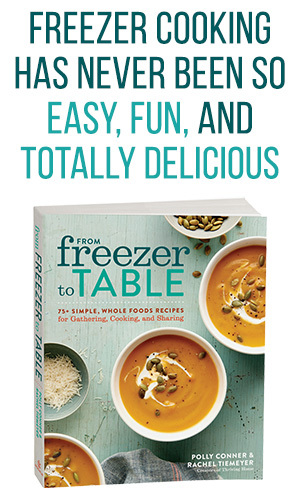 I love that these recipes are so unprocessed b/c so many that I’ve looked at online have prepackaged/made food (ie. Italian season mix, salad dressings, etc) and I dont want our daughter on so much sodium so early. Thank you for sharing this. My question, (sorry if this is a really dumb one) is I freeze everything in the casserole dish (a glass one or something), I can just bake it in the oven for 350F and for 20-25 minutes and it will be hot enough? Do I have to defrost in fridge overnight? I also assume that the safe for baking glassware/corning wear won’t break from temperature change? Also, I have never had a corningware or pyrex glass dish break from the heat changes. Pyrex can actually shatter if it changes temperature too quickly. When I was about 8, we had a pan of brownies made in a pryex pan sitting on the stove. It was at room temperature and the burner was turned on. The pan shattered, after the burner only being on for five minutes. And Pyrex is not made from the same materials as it was 20 years ago, even Pyrex themselves have said that the materials are different. A co-worker of mine had a casserole cooling on the counter when the dish exploded and sent glass flying everywhere. 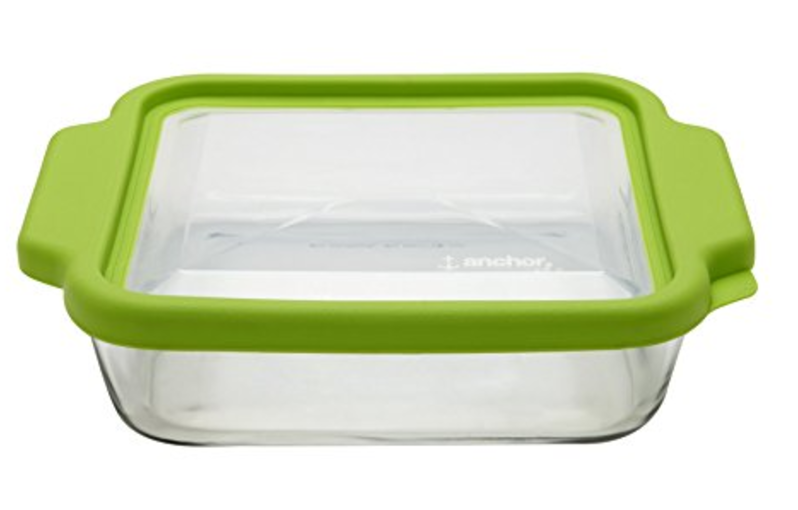 Anchor-Hocking is a much better brand than the new Pyrex. Thanks for the heads up about this brand. I made the same mistake you did and left a glass casserole dish on a hot burner. It was so scary when it exploded! 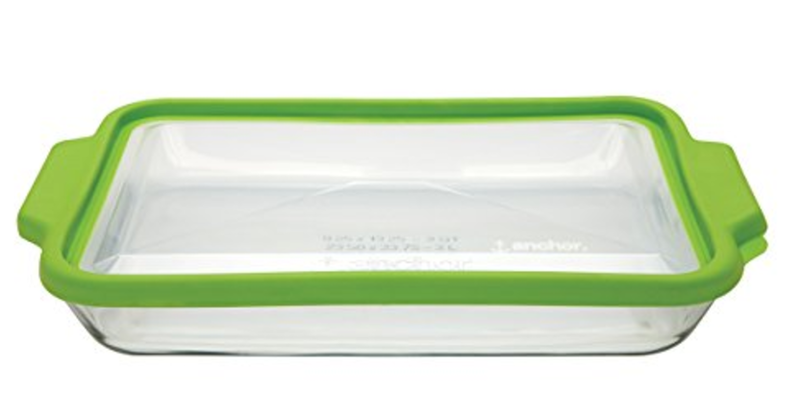 I didn’t know that Anchor-Hocking is a better brand…thank you! I had an Anchor-Hocking casserole dish explode in my oven before. I only use Pyrex now, and have never had an issue. I had a Pyrex explode years ago when I placed it on a hot burner by accident. It is very scary. I obviously didn’t follow directions, but it was still scary. I have never had one explode in my oven, especially at a normal temp like yours, though. I did a little investigation after your comment. I found this video report (below) on Consumer Reports. It sounds like it’s EXTREMELY important that Pyrex and Anchor Hocking (which are made of the exact same material) are used only as directed. Extreme temperature changes should be avoided. So, I will not put a frozen pan directly into a hot oven, for instance. Consumer Reports also reported that the European-made glassware (a different material and ironically what Pyrex and AH used to be made of) was less likely to shatter due to temp changes. It might be worth watching this video, just to make sure we are all using our glassware the right way. How would you freeze this in a bag? Not quite sure how this works as a freezer meal for me. Cool! I hadn’t thought of doing that before. Thanks for sharing, Jac! Great tip! 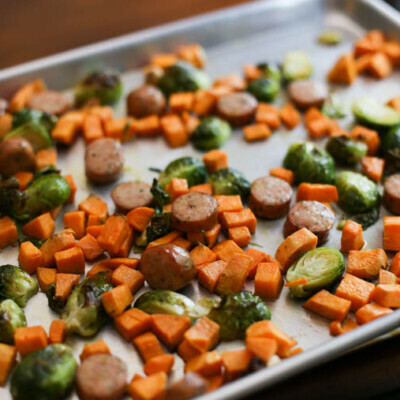 I am going to try this one for our freezer meal swap! Thanks for the recipe! I am making a bunch of freezer meals for this next semester of nursing school, since I have clinicals until 6 PM one day every week. I definitely want to try this one out, but I was thinking about putting noodles on the bottom of the pan – Cooking them al dente so when I put them in the oven they will finish cooking. Do you think that would work? So glad you’re trying freezer cooking. 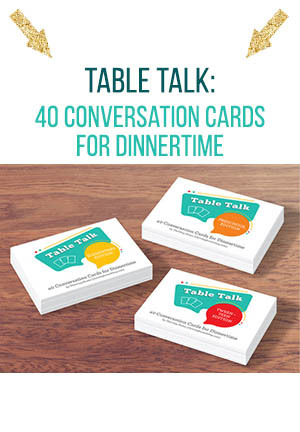 What a great way to make your busy work life easier and to keep eating healthy. I really like your idea of adding in al dente noodles, but I’m thinking you’ll want to toss them with a little extra marinara to keep them moist. A little extra cheese couldn’t hurt either. Let me know how it turns out!